At Community Bible Church we have consistently seen that 40% of our website traffic are first time visitors from our local area. These visitors are primarily coming from Google Search and Social Media. While we don’t want to hide information from our members or returning site visitors, we have found that their time on site is longer and they will spend the time to find what they are looking for. If a first time website visitor has a hard time finding the key information they are looking for they will likely to disengage and move on. So, how do you make a great first impression with your website? This first starts with defining your goal for your website visitors. For Community Bible Church that is attending a worship service at one of our physical campuses in San Antonio or attending our Online Campus if they live outside of San Antonio, Texas. My guess is that your goal is pretty much the same. So, how can you do this? Clean and Vibrant Design - your website should look much like your church lobby: welcoming, clean, and clear. Use images or videos that give visitors a look into your worship experiences and church campus. Show friendly faces and engaging imagery. Communicate Clearly - make sure your service times and locations are easy to see and find. Also, make sure it is clear what families are expected to do with their kids and what that check-in process will be like before they arrive. Meet the Pastor - while your church is more than your Pastor, people still desire to feel a personal connection to their pastor. While you don’t need to feature your pastor on the homepage, you should make sure that people can get to know them on the website before attending. Offer Video Messages - before we go to a restaurant or hotel we check out the reviews. We want to see pictures, hear what others say, and get the best understanding of what we are about to experience. By offering your sermons via video on your website you allow potential visitors to get the great possible perspective on whether your church might be the best fit for them and their family. 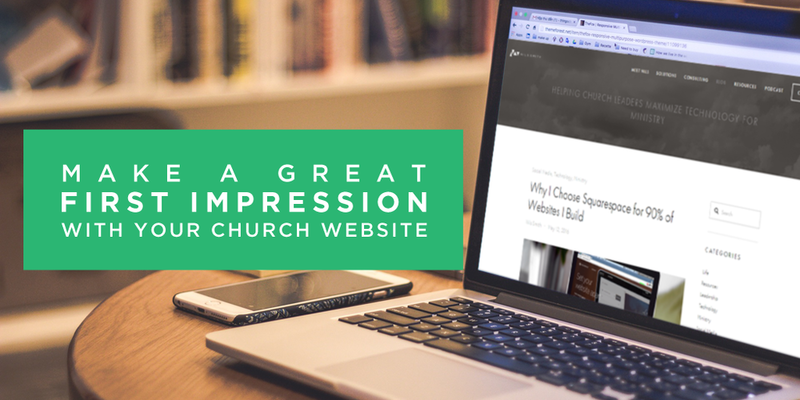 So, leave the clutter behind and create a great first impression that helps move people from curious website visitors to worship service attenders. How else are you helping to make a great first impression with your website? What sites out there do you see that make a great first impression? One other recommendation that I would encourage you to consider is a great value add that we have created: Live Chat. We have added a live chat feature to our website where a digital receptionist is logged in and ready to answer questions via live chat or visitors can leave a message that are returned within 12 hours. This level of engagement has proven to create a “wow factor” and personalization to the first impression we are creating with the website. Flexible - Wordpress is easy to update and easy to change. We have been able to change “themes” a couple of times since launching and the infrastructure has allowed for great flexibility. Customizable - having a development team like PlainJoe we were essentially able to build a custom website on the Wordpress CMS, so the freedom to customize for our unique needs has been huge. Since launching on Wordpress we have had minimal issues and continue to believe we made the right choice. We continue to watch trends, but don’t currently have plans to change anytime soon. Do you use Wordpress? If so, what has your experience been? Why did you choose or not choose Wordpress as your website CMS? By the way, if you’re looking for a good Wordpress Theme for your church, Church Themes provides a great option at an affordable price. I built one website just to test their platform and found it very easy to setup. While the customizations were minimal, the basic theme was very functional and great for churches on a budget with minimal design/development support. Wordpress or Squarespace for your Church Website? Squarespace is simple, flexible, beautiful and functional. Within Squarespace you can manage your domain, hosting, setup emails, and essentially have everything in one place. Just about anyone can build a Squarespace website in about an hour and have the site live and functional on the internet. Squarespace even makes it easy to setup simple PayPal donation forms within their management platform. The downside to Squarespace is that most Squarespace sites look the same and the customization options can be limiting. Wordpress on the other hand, seemed to take over the internet about 8 years ago and has continued to grow tremendously since then. Wordpress offers a powerful and flexible CMS and with the thousands of Wordpress themes available churches can customize a website that is completely unique. The challenge to Wordpress is that you have to setup emails, domains, and hosting on separate platforms. You also must continue to upgrade your account and plugins which often can be susceptible to attacks from hackers. So, which should you choose? Well, if you are looking for a clean, simple website and you are not real picky then I strongly recommend Squarespace. If you are looking for a very customized website and you are willing to pay for custom development then Wordpress is a great option for you. In the coming days I will share why I choose both Wordpress and Squarespace for different sites that I manage/oversee. I would love to hear which you chose and why. If you chose to use neither I would also love to hear from you!